Cabinets are a great solution to storage needs, especially when they are located in the two rooms where big and little items need to be put away to keep the area looking clean and organized. The kitchen, with all of its pots and pans, along with the bathroom and its personal items desperately need storage space, but this does not mean that it has to look dull and dreary instead of stylish and fashionable as part of the interior decorating scheme. Homeowners can spend a large amount of money to have custom cabinets built and installed in their home, but this isn’t necessary if you partner with reliable manufacturers that offer ready to assemble cabinets made from the finest materials. This type of product arrives with the pieces separated instead of already being put together which will cost you more making the ready to assemble (RTA) cabinets the ideal solution for individuals on a limited budget. Ready to assemble bathroom and kitchen cabinets can be purchased in a variety of looks including black, white and wood shades. Buy light oak or dark mahogany and easily install these according to the detailed instructions provided in the package. When you are reviewing the inventory options, it is necessary to know the square footage that you have available to work with and the amount of storage space that will accommodate your unique situation. There are several combinations to choose from that allow you to customize so that the final result will be everything you need and an increase over what you had before. 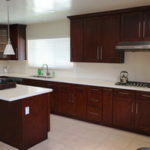 The best part is that no one will ever know you did it yourself, because the high quality ready to assemble bathroom cabinets and simple directions will make it look like a professional came in and did the job for you. The bathroom and kitchen areas do not have to be afterthoughts when you have the ability to make them look and feel as classy and upscale as every other room in the home. Take advantage of affordable prices and top inventory selections to give your home the facelift it needs, no matter what your budget may be.